WHAT DOES THE IRDO INSTITUTE DO? publish books, manuals, booklets, monthly newsletters and other publications. You are invited to participate – become our member! TRAINING AND CONSULTATION WITH ACTUAL TOPICS FROM AREAS OF SOCIAL RESPONSIBILITY. Why Slovenia doesn’t yet have a national strategy for SR and how is it like elsewhere? Other contents by request and wishes of the client. Providers: Experts and practitioners of the IRDO institute and its members, i.e. external associates for a given field. Price and scope: by agreement. We customize the offer depending on the request, needs and possibilities of the client. We carry out expert consultation for companies and organisations and organise the execution of socially responsible, marketing and development activities. We consult companies on areas of developing SR strategies, new products and marketing services in the context of SR. We show options of introducing social responsibility in business activities and present examples of good practice, especially through the Horus award. The funds that the IRDO institute gets from the organisations are used for non-profit activities and further development of the IRDO institute. More and more companies, foundations and organisations come across the need to know more about social responsibility. For this purpose, the experts of the IRDO institute are working on seminars and workshops on request. The educational contents are prepared by the wishes, needs and possibilities of the clients. The participants usually familiarise themselves about the basic concept of social responsibility, fields, advantages and weaknesses, standards, examples of business practice, news and concrete instructions on work in the client’s company, organisation or foundation. With the help of the participants, we design a program of development and depending on the possibilities and needs of the client, help realise it in practice. By request of the clients, we can also prepare specialized programs of training for different branches (internal, external programs). Send us your requests, wishes or needs at info@irdo.si. We look forward to working with you. We are educating CEO’s and Department managers, experts, who can gain our certificate Manager for Social Responsibility and Sustainable Development. If you are interested, please contact us! We carried out an expert consultation for the Slovenian network of social responsibility, working under the Ekvilib institute, in regard to the preparation of tender documentation for the European CSR Award Scheme. Magdalena Festival, a festival of creative communication for the young: the award for the most socially responsible work at the festival. The IRDO festival also bestowed the award for the most SR work at the festival for the first time. The winner was a music video titled “Svi u štrajk” (“Everybody strike!” by Dubioza kolektiv) (Author of the Idea: Mirza Čeho, Director of Photography: Aziz Čeho, Designer: Vedran Mujagic, TV/Film Director: Mirza Čeho, Year: 2008, Category: 4. Motion, Awards: Finalist IRDO Award). The second time we bestowed the award at the Magdalena Festival in Maribor in May 2009, the winner was a calendar titled “Think Different 2009”, Creative Calendar (3D, 6.600×0), Author of the Idea: Bojan Galič, Support: Saša Djordevic. Awards: Finalist IRDO Award). We also continued with bestowing the awards in the following years, you can find more information at: www.magdalena.org. In cooperation with the Kalidej association, an association for marketing communications (http://www.kalidej.net/) we participated in November 2007 at their Kalidays Festival and carried out the first call for an advertising text or banner on the topic of social responsibility. The topic of our call in 2007 was a project called DO-IT! The project was intended for the promotion of creativity of youngsters (high and higher schools students) in the sense of developing new proposals, ideas and projects for socially responsible activities. The social responsibility of companies is indirectly connected with the development of Slovenia and contributes to a bigger motivation of employees to work, a better relationship between employers and employees, a positive development of a social picture and the country as a whole. That’s why we in the Scientific Council at the IRDO institute developed an initiative for preparing a national strategy of development of social responsibility. The partnership in developing a national strategy began in 2012 and consists of various experts in the field of social responsibility, representatives of organisations and institutes, and experts, sadly not yet from the highest positions in ministries, as informal participants, because they haven’t received any formal authorisation yet. 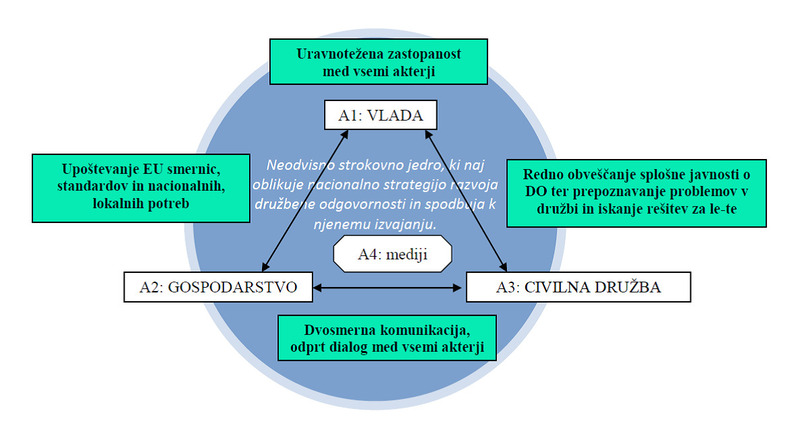 The partnership is coordinated by the Network of social responsibility in Slovenia – the Ekvilib Institute (organisationally) and the Institute for the development of social responsibility – IRDO (in content). We prepared the design for the Slovenian national strategy for social responsibility, with emphasis on companies. The strategy follows the ISO26000:2010 standard, its scope and principles. It includes key groups of stakeholders (the government, the economy, civil society and media) and intends to prepare plans of action – in areas of relations with the community, employees, environment, market and leadership. We strive to transmit actual and relevant information about social responsibility to the Slovenian public. That’s why we inform the media and the public about the work of the institute and its collaboration with our partners in regard to activities and projects dealing with social responsibility. We collaborate on several festivals, such as Magdalena Festival (2008, 2009, 2010, 2013) and Kalidays (2007, 2008). We regularly report about our work to the media, members, partners and other organisations in the community. We promote experts, foundations, organisations and companies that work in the field of social responsibility in Slovenia, because we realise that by sharing the information and examples, we contribute to raising awareness and the development of social responsibility in Slovenia and elsewhere. For members of the IRDO institute, we prepare monthly newsletters about social responsibility (IRDO news). We exchange experiences, knowledge and practice. Subscribe for a free copy and join the members of the IRDO institute! You can join at any time; the application form can be found here. For more information, send us an email at clani@irdo.si. We have forwarded a lot of information in areas of social responsibility to the media, mostly by organising conferences, bestowing the Horus awards and carrying out international projects. We have monitored our publications, as well as other news about social responsibility in the media. We present the results of an increase of the number of publications on the topic of social responsibility in media each year at our IRDO institute conference, in cooperation with Press Clipping d.o.o. that monitors these publications in the media. Since 2008 we publish a magazine called IRDO Mozaik for our members, the first Slovenian socially responsible newspaper. SIQ conference on the topic of Systems of leadership and social responsibility, 19. June 2012 in Ljubljana. Speeches by Ddr. Matjaž Mulej and M.A. Vesna Kovačič from the IRDO institute. The IRDO institute regularly publishes various literature in areas of social responsibility. in cooperation with Press Clipping d.o.o. since 2007, we monitor publications about social responsibility in Slovenian media. We welcome you to buy some of our books. Contact us for orders. »The impact of sufficient and necessary personal integrity on the psychological wellbeing of the employee«, author Simona Šarotar Žižek and Borut Milfelner, 2013, IRDO institute. Co-issued electronic book (CD) about sustainable development (40 authors from 4 continents): Sustainable Future, Requisite Holism, and Social Responsibility (Against the current abuse of free market society) – ISBN 978-961-91826-4-2, authors: Stane Božičnik, Timi Ećimović, Matjaž Mulej, with co-authors, editor: Prof. Emeritus DDr. Matjaž Mulej. 2008. Publisher: ANSTED UNIVERSITY, Malaysia, in cooperation with SEM Institute for climate change, Korte, Slovenia, and IRDO Institute for the Development of Social Responsibility, Maribor, Slovenia. Co-issued printed book about protecting the environment: The Climate Change System – introduction Authors: Timi Ećimović, Matjaž Mulej Publisher: ANSTED UNIVERSITY, Malaysia, in cooperation with SEM Institute for climate change, Korte, Slovenia, and IRDO Institute for the Development of Social Responsibility, Maribor, Slovenia. “The introduction of social responsibility in the business practice of small and medium-sized companies in Slovenia” (Handbook with examples of good practice, 2007), you can get the pdf here, in Slovene.